Perfectly perched in Monteray Shores, this beautifully decorated home is sure to set your spirits soaring. Opportunities abound to play during the day and to relax at night while you enjoy the spectacular sunsets as they splash across the skies. 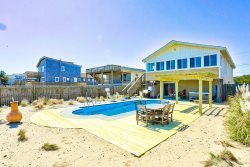 Monteray Shores offers a wide variety of community amenities and is conveniently located to all of the shops and attractions in the town of Corolla, ensuring that inside and out, guests will find more than enough activities to fill a grand vacation. The top level is home to the elegant and carefully outfitted great room which boasts plenty of room for guests to stretch out and relax. Enjoy evening family meals in the sunny dining area, relax with a movie night in the comfy living area, or just experience with locally caught seafood and fresh ingredients in the kitchen. With lots of gathering areas – as well as an adjacent king bedroom and steps-away porch with enticing views – there’s plenty of reasons to reconnect and unwind in between beach trips. With a wealth of activities in the neighborhood and at home, guests will find fun around every corner at Pelican’s Nest. Plan now for a stay in this accommodating retreat, and brighten your anticipation for a fun-filled vacation. .8 mile /16-minute walk to Dolphin Street beach access. 1 mile /3-minute drive to Bonita Street access with public parking.